An ancient technique for alleviating many types of muscular degeneration and various other ailments associated with Scoliosis — including decreased cognitive ability and even depression — is yoga. This practice is at least 5,000 years old, but new research suggests that it is even older based on archaeological findings in the Indus Valley. There are entire forms of yoga dedicated just to the alleviation of scoliosis symptoms. Some yoga teachers teach to students with profound knowledge of the disease since they used yoga to overcome it themselves. To reduce tension on the spine, both laterally and up and down, you can practice poses like Spinal Twist (Matsyasena), Standing Forward Bend (Utansana) and Downward Facing Dog (Adho Mukha Svanasana). If you want to try a different approach to alleviating scoliosis symptoms because yoga is not available to you where you live or you cannot find time to go to a class, you can practice some simple stretching exercises at home. The idea is to counteract the loss of muscle in some areas, and the tightness of muscles in others due to the incongruous movement of the spine within the body. Please remember that you should not do any aggressive movement when you are feeling acute pain. It is better to start small and build up the intensity as your symptoms decrease and you build more strength and flexibility. As much as you can get full rotation and a variety of movement, you will see an increase in both your ability to stand and sit longer, and also the pain, discomfort, and other inconveniences of the disease. If you have seen an ancient medieval device in drawings or movies that stretches the spine via a crank, then you know the basic premise for the modern spinal decompression machines used in many therapy offices. 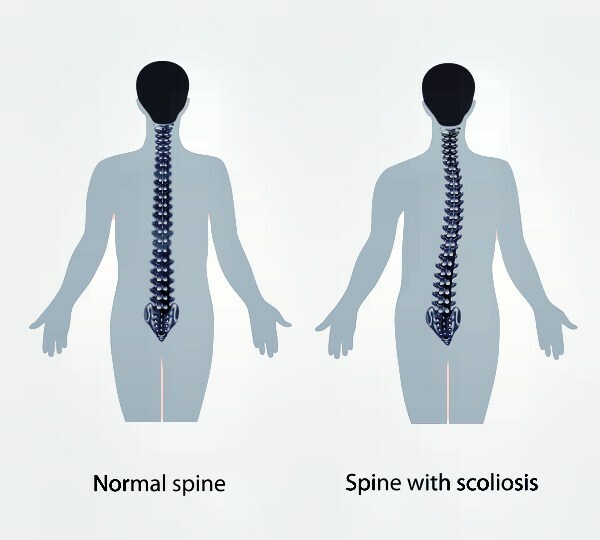 Although the machines can look intimidating, they are actually very helpful in alleviating scoliosis symptoms because they slowly increase the space between vertebrae, relieving very severe pain caused by bulging, slipped or ruptured discs that ooze out from between spinal bones and touch the spinal nerves where they shouldn’t. The machines used for decompression do just that – they release compressed bones and discs by using graduated weight and a gentle pulling. Usually the scoliosis patient lies on a table and a belt is Velcroed around the waist. The weight is set on the machine and the lower half of the body is stretched from the upper in small increments via the hips. This allows more space between the vertebrae, alleviating pain, and slowly correcting asymmetry in the body. Finally, if these alternative treatments for scoliosis symptoms don’t work, there are more minimally-invasive types of surgery now that require less ‘hardware’ than traditional methods of the recent past. There are some very disturbing photos of both the scarring that can result from spinal surgeries and X-rays of hardware that was meant to straighten the spine but did not successfully do so. Minimally invasive spinal surgery was first performed in the 1980s and has made much progress since that time. The incisions are becoming fewer, and the instruments needed to correct spinal issues, smaller and smaller. Open lumbar surgery used to require a minimum 5 to 6 inch incision and now they are often as small as the head of a writing pen. This reduces the need for heavy narcotics, reduces the loss of blood during surgery and completely changes the length of recovery time needed post-op. There is less pain, less scarring and people can often return to their regular activities much sooner, leaving one pretty much free of scoliosis symptoms. Scoliosis is a very common spine condition affecting at least 4 percent of people throughout the world. Even though it can be crippling, debilitating, and painful, scoliosis does still offer treatment options for some. Those who suffer from or develop scoliosis should understand the traditional options for treatment of scoliosis and how to determine which type is needed. There are three main traditional treatment types for scoliosis: observation, non-surgical bracing and surgical intervention. Each type has its use and unique factors which determine its necessity. Some forms of scoliosis do not yet require bracing or surgery. For these types, observation is the least invasive manner of treating scoliosis. During observation, measurements may be taken occasionally to keep tract of any progression of the curvature of the spine. Sometimes, imaging and x-rays can track this progress as well. Repeat visits to the primary care physician or orthopedist may be necessary. This allows the physician to keep up to date with any changes in physical aspect or pain and discomfort the patient may experience such as cracking back, aches, muscular spasms, and so forth. Applying a brace to the patient with scoliosis is an attempt to stop the progression of a twisting spine. While still non-invasive, this type of treatment can be uncomfortable or irritating at first; however, patients quickly get used to the feeling of the less-intrusive modern braces. The brace can be worn under clothing so that it is not normally noticeable by others. A brace may be worn as many as 23 hours after one has gradually become accustomed to it. Braces are custom-made by an orthotic specialist to meet the needs of the scoliosis patient. The most common braces are the Boston Brace, the Charleston Bending Brace, and the Milwaukee brace. Other examples might include the Providence Brace, Wilmington Brace, and SpineCor. No matter which type is chosen, all attempt to stop the degrees of curve from worsening. Bracing can be a common practice for lordosis and kyphosis treatment as well. The most invasive manner of scoliosis treatment, surgery, is sometimes deemed a necessary option to prevent discomfort and further damage – even death – of the patient. Sometimes, the surgery will just deal with some of the aftermath of the damage such as with herniated disc treatment. At other times, bones are fused together. For some surgeries, rods and screws may be implanted along the spine to straighten the angles. Because it is so invasive, surgical treatment of scoliosis is usually a last option if observation and bracing are possible. The type of treatment of scoliosis often depends upon the progression stage and age of the patient. Patients who are done with their growing stage may not be able to be corrected and may be simply observed. Observation is also common for patients with mild, non-progressive scoliosis. Younger patients with progressive scoliosis may be braced or some might have surgery. Surgery is usually reserved for those with greater curvature that affects the lifestyle or health of the patient greatly. Scoliosis can be mild to debilitating with varying degrees of treatment options available for each type and each situation. No matter how severe a case of scoliosis, modern advances in medicine allow for a treatment of scoliosis for nearly ever case in ensure a healthier, more comfortable lifestyle for those who are diagnosed with this condition.